Leadership is a vital part of the Scouting program. Boy Scouts in positions of leadership run the troop. They take care of the many tasks necessary for troop and patrol meetings and activities to run smoothly. By accepting the responsibilities of troop leadership, Scouts are preparing themselves to be leaders throughout their lives. The badge of office presented to a Boy Scout who is accepting a position of troop leadership does not automatically make him a good leader. 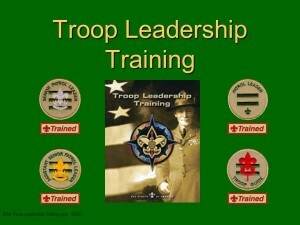 Troop 101 will be holding Troop Leadership Training March 11th – 13th, 2016. This year we are holding the event at Camp Thunderbird. This will be an exciting opportunity to learn about how to become a better leader, as well as to participate in a lot of games and activities that will show you the lessons in action. There will even be a game of hide and seek! We will be meeting at Haggen’s by Dairy Queen at 6:30 on Friday, March 11th and we will return around noon on March 13th. This is a great opportunity for all scouts; there is no age or rank requirement! Because we are in a cabin, you need your 10 Essentials, a sack supper for Friday (or eat before we meet), sleeping bag, and any snacks you want.